BOWLING GREEN — Nehemiah Hill’s teammates are just like him. Born with spina bifida seven years ago, the Hopewell-Loudon Elementary School first-grader doesn’t have feeling from about the middle of his thigh area down. He has found more independence since playing for the Northwest Ohio Arctic Wolves, a sled hockey team based in Bowling Green. He was one of the first players on the ice during practice at Bowling Green State University Sunday. “It’s pretty cool,” he said of the sport. His mother, Stephanie Ruhlen, said Nehemiah was born with spina bifida and will have it for life. He gets around with a wheelchair and will always be in one, she said. Ruhlen said her son is a happy kid and has changed her outlook on life. Members of his sled hockey team have various physical disabilities. They’re all friends and all look up to each other, Ruhlen said. “The families are all close-knit, too,” she said. 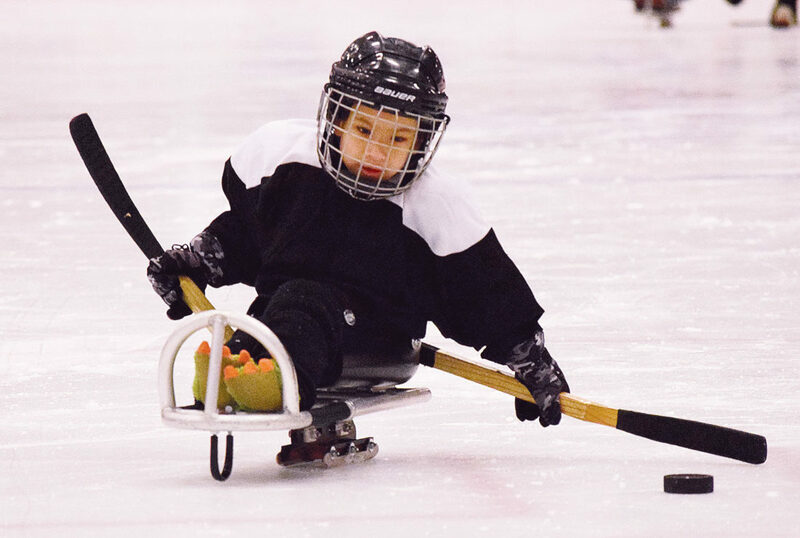 Nehemiah rides on a sled with blades and uses two hockey sticks with picks on each end to propel himself forward. This was his third season on the team. Ruhlen said the first season was rough for him, and he didn’t like it because he wasn’t very good. It “clicked,” and he was able to do it on his own during an event with a fire department the first year, she said. He did a little bit better the second year. They practiced in the summer during the off-season and would go to open skate, and he did so much better, Ruhlen said. Ruhlen said she grew up in a basketball family and was unsure when her son was asked to play hockey. “I still don’t know everything (about it). … You learn as you go,” she said. The season started in September, and the team practices every Sunday during the season. Sunday was the last practice of the season. About 25 youths from places such as Tiffin, Lima, Toledo and Bowling Green make up the team, and they travel to tournaments in Columbus, Fort Wayne and Grand Rapids, Michigan. Stephanie Rine, general manager of the team, said the state’s sled hockey organization has been around for about 15 years. “Under that umbrella is a Cleveland team, a Columbus team, Cincinnati and then northwest Ohio,” she said. Nehemiah said the games are his favorite part of playing hockey.